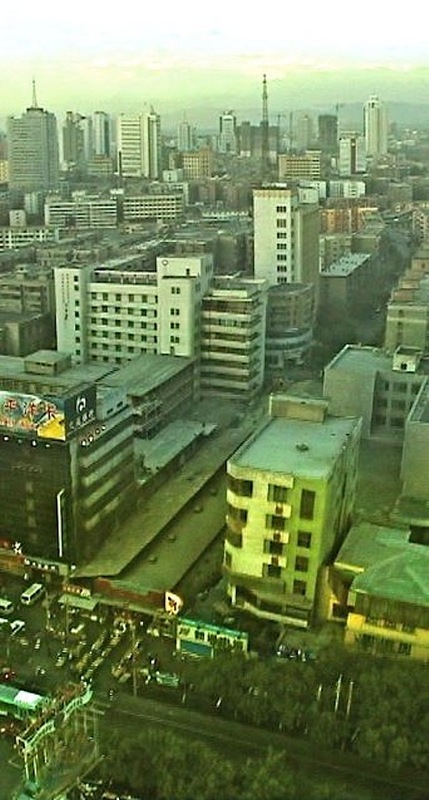 The riots in Urumqi, XinJiang, in the last few days costed over a hundred lives. It is threatening to become an ethnic battle between the Uighur and the Han ethnic groups of Chinese. I hope this turmoil will be settled without too much more bloodshed. 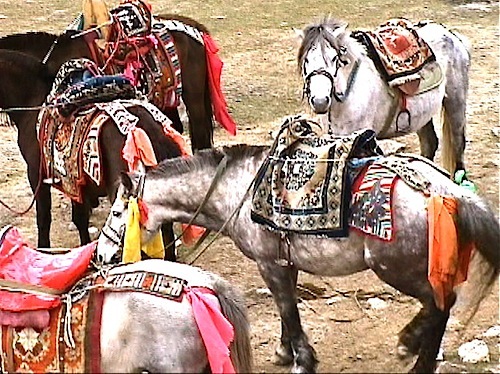 Tibetan horses sported beautiful saddles. I would love to buy one as souvenir. 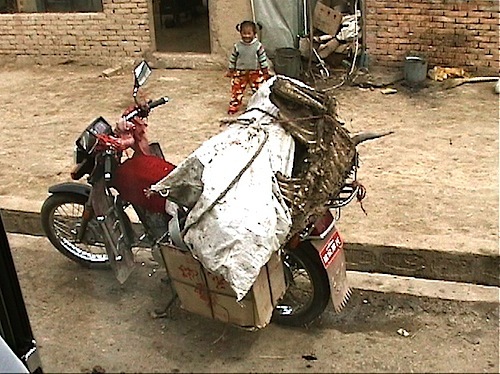 A Tibetan motorcycle carried a scavenged carcass, probably as feed for his dogs. 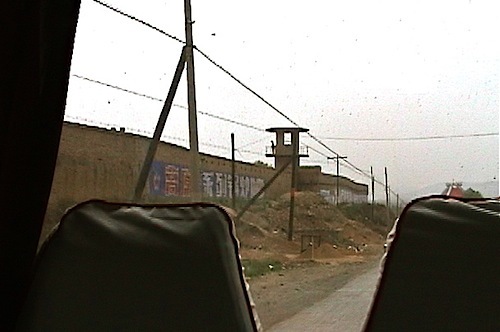 We passed by a prison surrounded by high walls and guard towers. 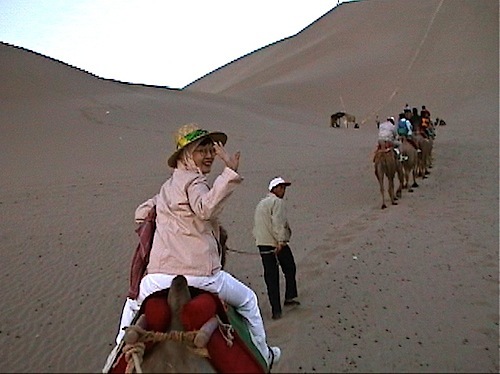 We woke up early one morning and rode camels to see sunrise on top of sand dunes. This was the last fort JiaYuGuan 嘉峪關 on the Ming Great Wall. This was the ruins of GaoChang city 高昌, a Chinese administrative center of XinJiang region during the Han and Tang dynasties, 2,000 years and 1,300 years ago, respectively. Another city ruins was the JiaoHe city, 交河故城, another administrative and military center during the Han and Tang dynasties. A more recent relic is the QiaoWan city, 橋灣古城, built during the Qing dynasty 300 years ago next to a runoff river 疏勒河 from the mountains. The officials charged with building this city were caught swindling funds, and were executed by the emperor who made drums with their skins as deterrent to other officials. 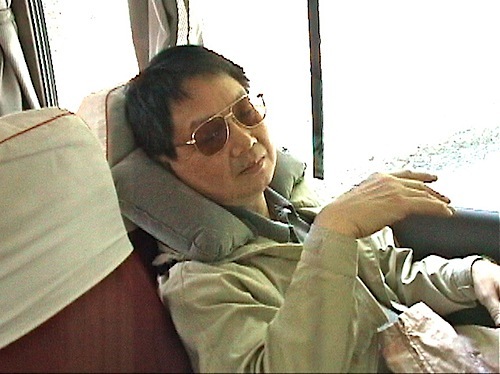 That history apparently is lost on the current corrupt Chinese officials. 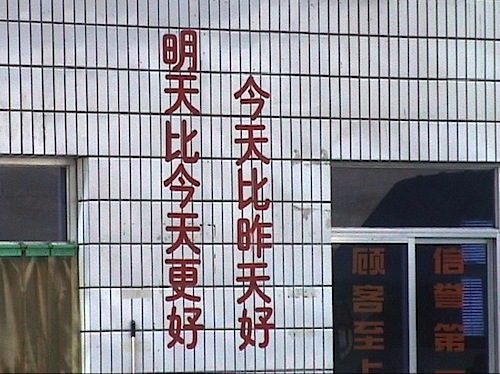 As we advanced further into XinJiang, reminders of Chinese presence popped up occasionally. 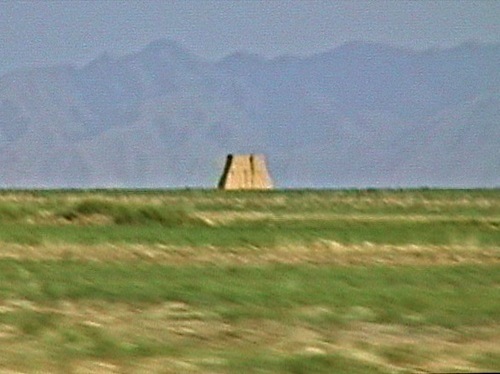 This was a beacon tower charged with warning of armed intrusions and relaying military information into China proper. 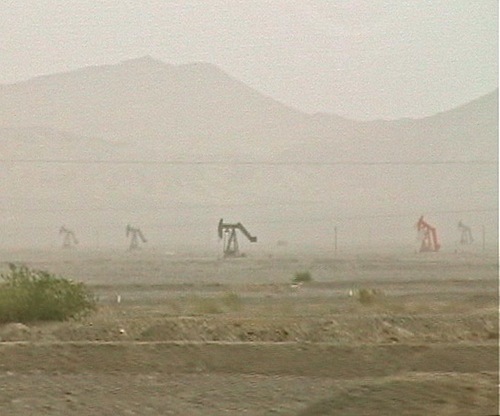 XinJiang, like most Muslim lands, is a producer of oil. 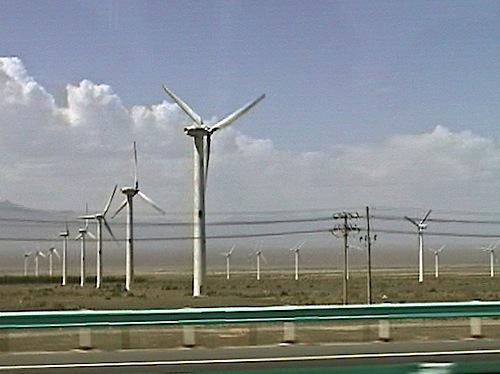 Renewable energy was also being developed in XinJiang. This was the largest wind farm in China, but China is planning to build many additional farms throughout China. 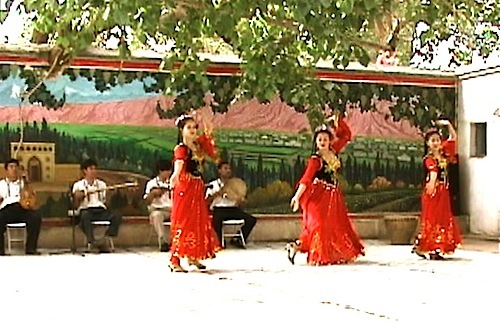 In an Uighur village, we were entertained by local dancing. XinJiang music, dance and musical instruments have been incorporated into Chinese Han culture since 2,000 years ago. As the weather was perfect for growing grapes, dozens of varieties of raisins were available in this region. The mountain range TianShan 天山 was renowned for its beauty. 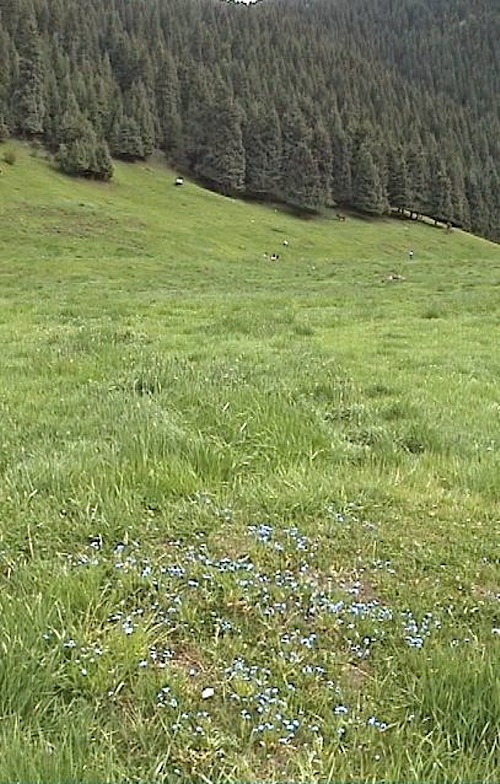 We visited a mountainside meadow below a forest of evergreens. 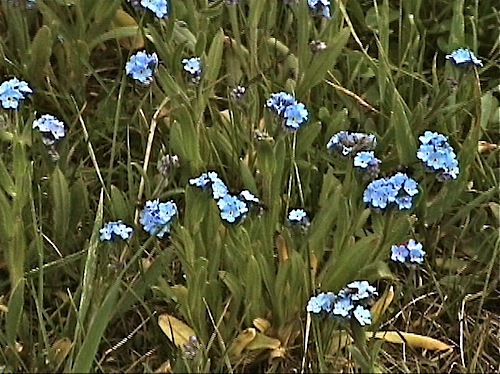 The meadow was covered with blue and yellow flowers. 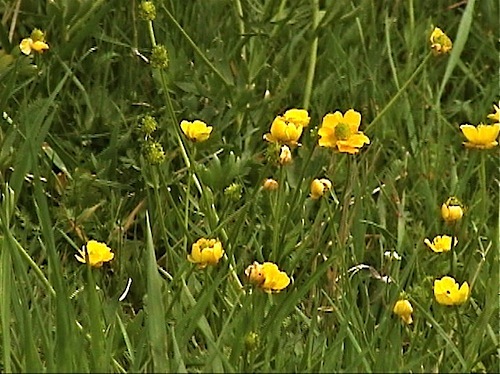 An Uighur man was employed to keep the meadow clean. He admonished us when we picked a few flowers. Although we did not understand his language, his intentions were clear and we refrained. 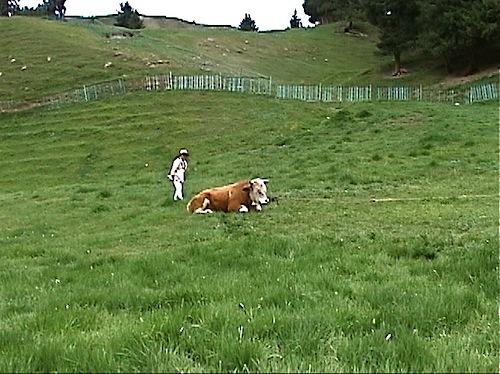 Sally was courageous and approached a gigantic cattle. Fortunately it ignored her presence. 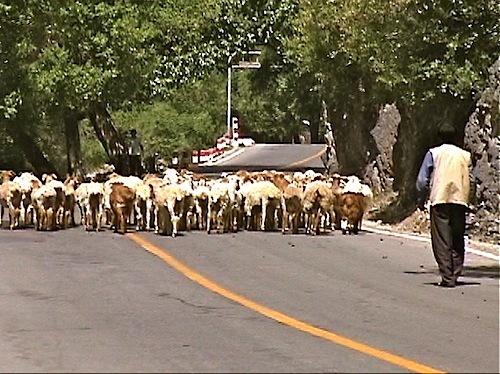 A local shepherd walked his sheep on the road. 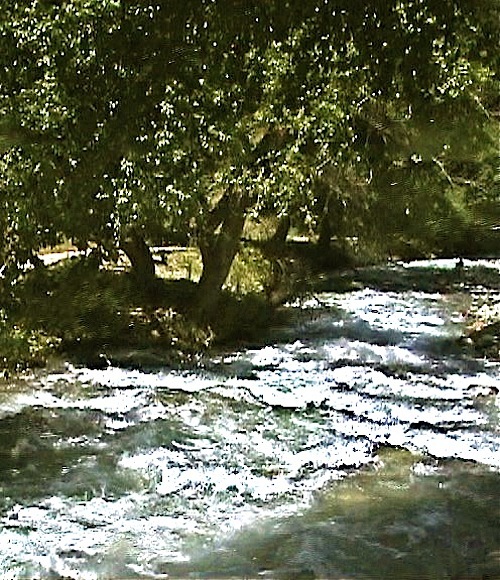 A roaring mountain stream ran off the famed Heavenly Lake 天池. Unfortunately, I became sick and had to stay in the hotel in Urumqi for a day, missing the whole-lamb feast. The doctor stationed in the hotel diagnosed me with a severe food poisoning and gave me intravenous drip of Chinese medicine. Miraculously, I was cured in hours. 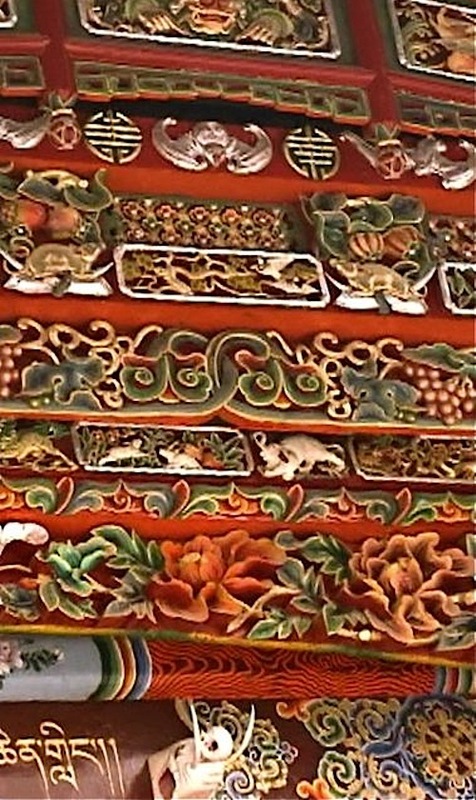 Due to the sickness, we missed touring the city of Urmuqi. I could only take a picture of the city from my hotel window. Posted by Robert Wu on Thursday, July 9, 2009, at 9:11 pm. Filed under Uncategorized. Follow any responses to this post with its comments RSS feed. You can post a comment or trackback from your blog.